Michael Lawrie never used a mill machine in his life. So you would think he would be pretty pleased with himself after learning to use a mill and other tools to craft a nifty iPhone stand out of metal in EAS 141. But he refrained from patting himself on the back. 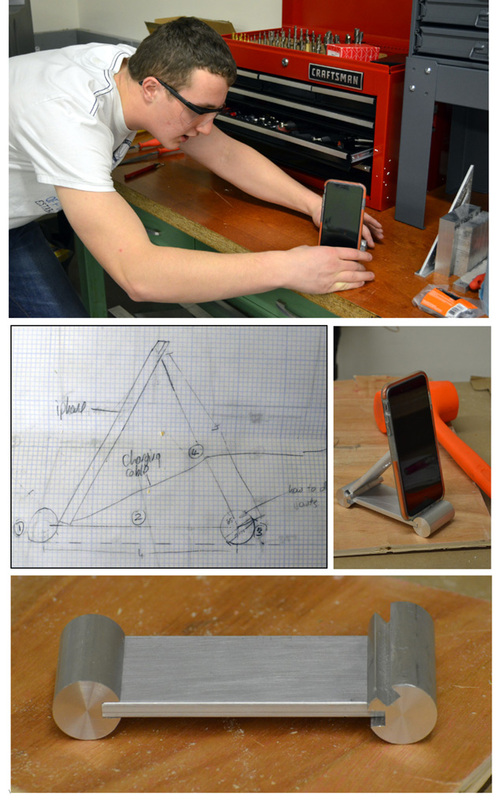 Instead, Lawrie, a freshman in mechanical engineering, began critiquing his creation – wondering if he should trim the supporting arm back a bit, for example, so the phone would rest at more of an angle. That comes as no surprise to Jim Alkins, the Senior Laboratory Engineer who teaches the basic mechanical fabrication class in Rettner Hall. “These are some of the brightest students I’ve ever known. They’re looking to learn,” says Alkins. And, like Lawrie, many of them set a high standard for themselves. Some of the students come to Alkins’ class not knowing a dremel from a drill. They’ve come to the right place. 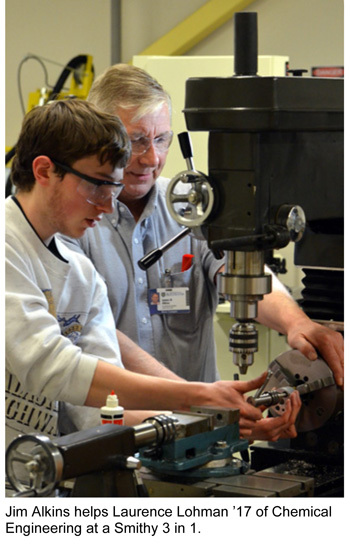 Offered since fall 2009, EAS 141 was initially taught at the professional machine shop in Taylor Hall, with John Miller, Senior Laboratory Engineer, as instructor. “John was generous in opening the Taylor machine shop to student education, said Jim Zavislan, Associate Dean of Education and New Initiatives for the Hajim School. “Through John's instruction we were able to develop the facility and curriculum for the course as it now stands.” However, there was a limit to how many students he could train, hence the decision move the class to Rettner. The brand new Smithy 3 in 1 machines in Rettner Hall’s fabrication shop, which was completed in 2013, are a good starting point for students with only limited experience. Combining lathes, drill presses and mills, the Smithy’s “teach them all the fundamentals of the big machines in a non-intimidating way,” said Alkins. Once comfortable on the 3 in 1 machines, the students can then move over to the larger LeBlond lathe, for example, for work that requires greater precision. Why is this important for the budding engineers and computer scientists who take this class? Even with the current emphasis on computer assisted design, an understanding of how things are fabricated remains important, Zavislan said. “This class provides students with an understanding of fabrication techniques and tolerances as well as how to communicate with others about their designs,” he said. Each student is expected to complete a fabrication project, with a supporting paper that describes how it was made. Alkins allows students to come up with their own projects, stipulating only that they use as many different machines as possible. Amid the whine of saws and the pounding of hammers, Alkins calmly circulates through the shop. “I can tell by the noise if somebody is doing something wrong,” he says. The students are clearly comfortable asking Alkins for help. Everyone is on a first-name basis, and Alkins makes it clear his door is always open. But certain rules are clear, especially regarding safety. When a student enters the shop to talk to Alkins while the class is in session, she is immediately reminded to put on safety goggles.